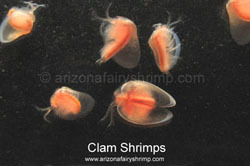 Dry Lake Clam Shrimps are very active for a month after hatching, then they go down to the bottom of lake and stay laying on the mud or digging around. 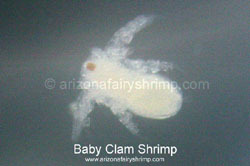 Most of them don't go up to the surface of the water unless the water is too warm or other bad conditions happen. Usually they are bright orange color, and become dark-red after a month, and it'll be hard to see through the shell because algae(bacteria) will grow on the outside of the shell. They grow up to 3/8 inch (10 mm) long, 1/4 inch (7 mm) wide, 1/5 inch (5 mm) deep (shell size), and live longer than 12 weeks in best condition. 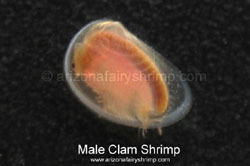 Only about a half of male clam shrimps find its mate in their lifetime. When a male clam shrimp finds a female, they bind together and only the male swims around in the water or they sink down to the bottom of the water. 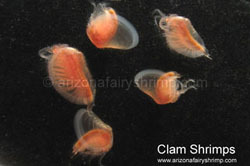 And they don't separate until one side dies or forced by some occasions, but all the female clam shrimps can produce eggs either having partner or not. Female clam shrimps develop the eggs in the body and when it become mature they keep the eggs inside the shell for a while before release. 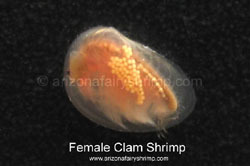 Sometimes eggs are kept inside the shell even when female clam shrimp dies before releasing, yet those eggs can hatch, too. Dry Lake Clam Shrimp's egg is very small (about 130~160 micrometer), and looks like a shiny yellow ball. Usually eggs hatch out in about 30 to 48 hours (sometimes in 16 hours) after exposed to the water, and baby clam shrimps are about 300 micrometer long when just hatched. 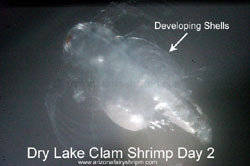 The shell will be developed on the back (up side) on the next day, and becomes bigger to cover whole body of the clam shrimp in another two days. 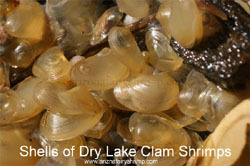 Clam shrimps are growing slower than any other crustaceans in the dry lakes of Arizona, but live longer.